RECORDED IN HIS HOME BOROUGH OF BROOKLYN, NY, RENTING HAPPINESS WAS DAN'S FIRST STUDIO RELEASE AND SHOWCASED HIS LOVE OF HOOK-FILLED FOLK-ROCK. Dan was joined on this CD by Bill Konig (bass), James maher (guitar), Dan fielding (drums) and Matt mcgrail (vocals, percussion). The title of the album came one day as he was entering a video store to rent the film "happiness" starring Phillip Symore Hoffman. It struck him as odd that he was "renting happiness". This led to the writing of the title track. The CD design is by Adam hess. IN 2005, DAN TEAMED UP WITH PRODUCER CYRILLE TAILLANDIER (LENNY KRAVITZ, ANGELIQUE KIDJO, KANYE WEST, LE TIGRE) TO RECORD ROCKING CHAIR in Brooklyn. TOGETHER THEY CREATED A RICH SONIC LANDSCAPE THAT REFLECTED the full spectrum of DAN'S musical influence. Dan and cyrille set out to explore the "wall of sound" concept, creating small moments of pet sounds-esque ear candy pleasure throughout the record. One of the standout tracks, our souls, is a tip of the hat to one of dan's most loved songwriters, john lennon. dan is joined on this record by bill konig and pascal lajoye on guitars, fabrice calmettes on bass, larry lelli on drums and kate mcguire and matt mcgrail on vocals. the title track was co-written with matt mcgrail in a cabin in the woods of new hampshire. adam hess once again designed the cd graphics. IN 2008, DAN JOINED FORCES WITH PRODUCER ROYCE JEFFRES (STING) TO RECORD CIRCLES at NYC'S FAMED EDISON STUDIOS. On this record, DAN wanted to dive deeper FOLK, COUNTRY AND INDIE ROCK, TAPPING INTO INFLUENCES LIKE UNCLE TUPELO, Elvis Costello AND LUCINDA WILLIAMS. Dan was joined on this record by the amazing Daydreamilla (Ted Looby, guitar and Mary Fifield, violin), Matt haden on banjo, seth travins and bill konig on bass, kate mcguire on vocals and todd talbot on drums. Dan's brother Marc Strauss plays trumpet on the jazzy, haunting "Open and Shut". the cover art s by kate mcguire and the cd design is once again the craftwork of adam hess. 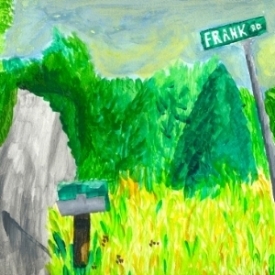 Frank Road was released in September, 2018. It is a collection of songs that Dan began writing and in the Catskill Mountain region of New York surrounded by the woods and the echoes of The Band. The recordings were produced in his home studio in Brooklyn and at Cold Brook Studios in Woodstock under the watchful eye of legendary producer, Julie Last.